Kingdom Heartshas been established as a purely Square Enix/Disney crossover, a joint project between the two companies. Because of the limitations that sets on the community, the fans have taken to a plethora of various other media in order to make their dreams come true, whether it be fanfiction, fanart, you name it! What are these dreams you ask? Why, to open up the doors to other worlds, from other sources no matter what it is. Amongst one of the most highly requested companies who've had their films crossed over with the series is, you guessed it, Dreamworks! We all crave for what we can never have, so in order to satiate that desire, I'm going take you through one of my favorite non-Disney films of all time and why I believe it's perfect for the series! "Deliver us. Hear our call, deliver us. Lord of all, remember us, here in this burning sand. Deliver us, there's a land you promised us. 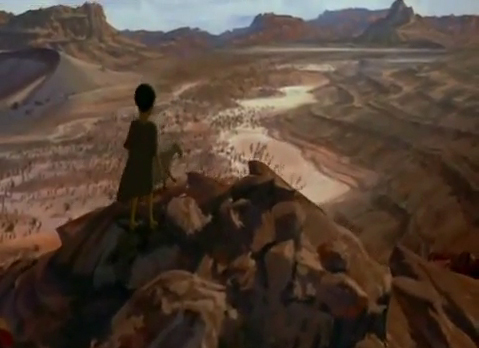 Deliver us to the promised land..."
And thus, we begin this editorial with a tale from the very beginning: The Prince of Egypt. I know what some of you are thinking: "Gasp! Dreamworks made 2D animated films?" Remember, there was a time before Shrek, you know. And so my answer to that question is yes, yes they did, and by George, was it a good one! At the time, it was regarded as one of the most successful non-Disney traditionally animated features, reaching second place behind The Rugrats Movie to earn over $100 million in the United States. Most fans of Dreamworks Productions often look back at films like this fondly, a simpler time when animation could be used to tell true heart-to-heart serious stories without fear of backlash for being "too serious for children," when children are not the only individuals making up the audience. Even so, it is a piece everyone can enjoy together as a family. This a film very close to my heart, having watched it time and time again growing up. Release in 1998, it gained generally positive reviews from various critics for its quality of animation, storytelling, music, cast of characters, and success in conveying the meaning that the film was built from: when you believe, anything is possible. Negative reviews stated that it lacked creativity, happy moments, and is far too serious. Well, I'd think you'd generally come to expect that such a serious story and depiction of an event like this would be low in those categories, so the logically lacking reviews aside, the film is absolutely extraordinary. 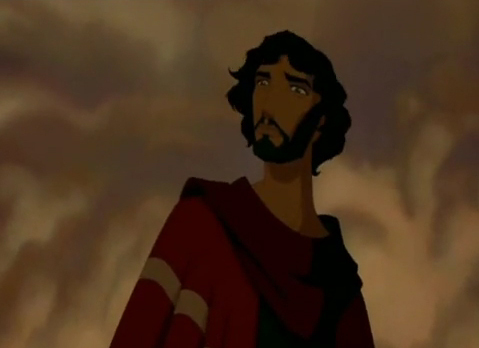 "I am a sovereign prince of Egypt, a son of the proud history that's shown etched on every wall. 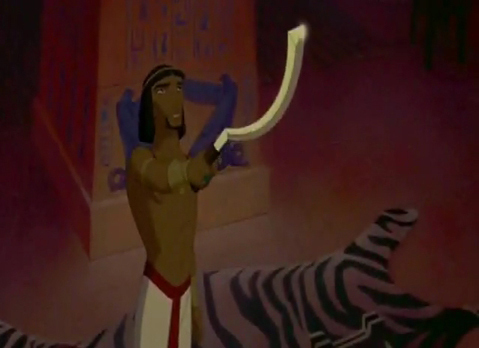 Surely this is all I ever wanted, all I ever wanted, all I ever wanted..."
The Prince of Egypt is an adaptation of the Exodus story, and tells the story of Moses, a prince of Egypt originally born a Hebrew slave, whose mother sent him adrift in a basket on the river for a chance to save his life. Although the story differs from the original in many ways, the base story does ring true. Moses eventually drifted into the Egyptian palace, where he was discovered by Queen Tuya, who falls in love with him instantly, taking him in as her own son and gives him his name. The lie that would form the basis of the story now set, Moses grows within the safety and luxury of the palace as the "second-born prince" to Pharaoh Seti and the younger brother of Ramses. It would not be until his encounter with his forgotten true siblings that he begins to realize the truth, one that's been nagging at him deep inside no doubt for years. When the time comes that he is forced to leave Egypt, he does so with a broken heart and leaves behind everything he ever knew to be true, everything he ever cared about. He was able to find a new home amongst the Mydians in the desert, but after witnessing the burning bush and discovering the message from God pointing him towards his destiny, he returns to Egypt in order to free his people from Ramses', the current Pharaoh's, tyranny. In doing so, he learns the possibilities that may happen when you believe. "So how can you see what your life is worth, or where your value lies? You can never see through the eyes of man. You must look at your life, look at your life through heaven's eyes." 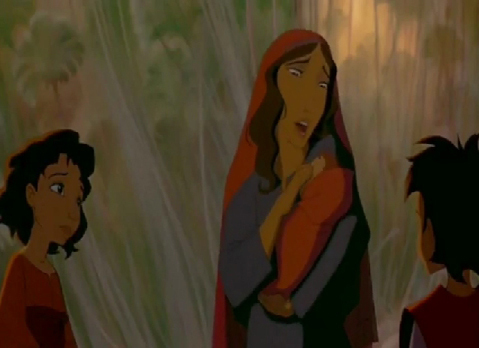 For some people, it is easy to see how Sora and Riku can be incorporated into the story of The Prince of Egypt. For others, not so much. 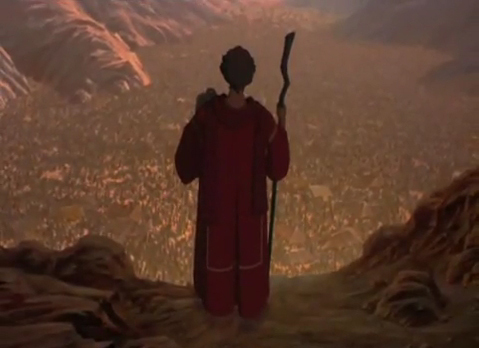 Despite the great desire for a world based after Hunchback of Notre Dame for example (now appearing in Kingdom Hearts Dream Drop Distanceas La Cite des Cloches), there is still much doubt about the success of the world which, while it features religion as an underlying theme, nowhere compares to the great proportions that lies within this film. And it is because of the religion that a considerable portion of the community is worried that La Cite des Cloches will not properly represent the underrated movie it's based on due to certain misconceptions that have developed about Disney over the years. Not even Disney, in the past decade or so, animated series and films have begun appearing as though they should be made with children and children only in mind, so they should be joyful, brightly colored and utterly magical in as many ways as possible. Although we've seen in recent years a return to better times in regard to it, the doubt lingers. However, despite what individual opinions may be, the development team at Square Enix have remained for the most part, true to the source. You may argue that due to poor level design, pathetic character roles in the underlying plot with the original characters completely overshadowing the Disney characters within their stories or what have you have failed to do the original justice, but the feeling cannot be said to be mutual for everyone else. But that's a story for another time, I think. "You who I call brother, how can you have come to hate me so? Is this what you wanted? Then let my heartbeat harden, and never mind how high the cost may grow. This will still be so; I will never let your people go." Why should there be a world based upon this movie? My personal bias aside, I strongly believe this movie contains many themes and possibilities for strong chemistry between characters perfect for the Kingdom Hearts series. Let's start off with the basics: who should visit this world? For the sake of simplicity, why don't we refer to Kingdom Hearts Dream Drop Distance'sdual scenario, with Sora in one area and Riku in another? Without a doubt, I believe if we follow this guideline, then Sora should spend time in Egypt with Ramses, and Riku in the desert with Moses. There is no one good or bad, but thinking makes it so. 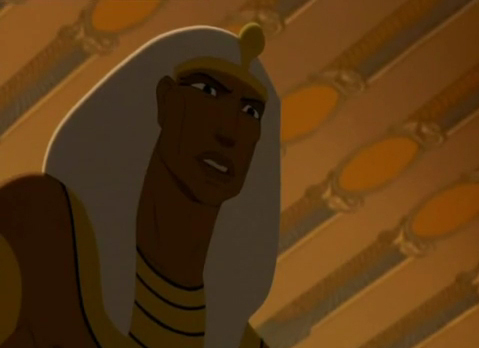 Pharaoh Seti and Ramses aren't evil, but painted in a bad light for the sake of the film. They were acting upon the goodwill for the sake of their people and all those who had come before them, in order to keep the legacy alive. Yes, millions of people suffered under their rule. Yes, Seti's hand did bear the blood of thousands of children. It's true that they didn't care, but they say sacrifices must be made for the greater good, only in this case, the greater good was for the benefit of the Egyptians and Egyptians only. Because of that, I believe if Sora arrives there at the right time, he will be able to understand why things are the way they are, and won't immediately oust Ramses as "a bad guy." Sora has never spent time on the other side. He has always conveniently arrived just in time in order to take the "good side." Many fans believe that if Sora were to become "evil," he'd finally obtain enough character development to make up for the amnesia that wiped it all away in Kingdom Hearts Chain of Memories. While I don't necessarily believe that this is indeed the right path for him, I do think that it will shed an interesting light should he be placed in unfamiliar situations. 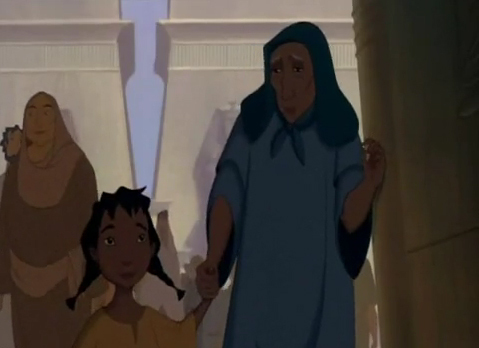 The relationship between Ramses and Moses would certainly help brighten his eyes on his situation with Riku. Ramses' strong, stubborn, steadfast and denying hand provides a nice contrast to Sora's own attitude and personality, thereby providing a nice balance. "You who I call brother, why must you call down another blow? Let my people go. Thus saith the lord." On the other hand, Riku would be able to find something in common with Moses, the two of them having done what they have both thought at one point to be unforgiveable and have since begun forging their own paths towards redemption. The desert is a harsh mistress, and while it is a prison it also hides within it a hidden paradise stimulating growth and promoting strength. "Never give up," is what it'd say if it had a voice. Riku will be able to find not only a partner in his endeavors, but also a mentor figure in Moses as well, likewise the other way around; they both have much to teach each other. 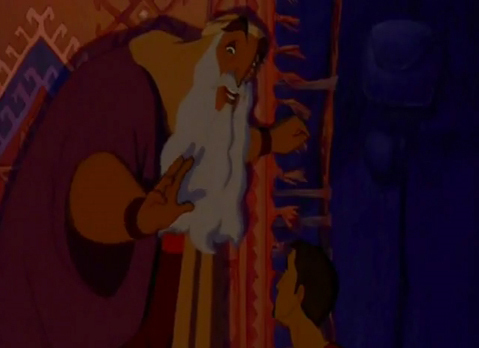 Although the story greatly involves messages from God in order to promote action on Moses' side, Riku can remind him that you don't always need to wait for a higher power to tell you what to do, when you yourself are capable enough of making changes in people's lives, no matter how small. If a single pebble can push a boulder, one individual will be able to turn the tide of conflict. Everyone is strong in their own way, but upon acknowledging that strength, it's what you do with it that matters. For Moses, he can support Riku in his endeavors and act as another pillar of support to remind him that he's never alone. As of this moment, it seems as though Riku continues to possess doubt that he even deserves the right to have the Keyblade, let alone wield it. As there are no coincidences in fate, Moses will be able to strengthen the foundation upon which Riku's physical, emotional and mental being stands upon. It's not as though Riku is incapable of standing on his own two feet, but if there's one thing he's most often criticized of, it's that he doubts himself perhaps a bit too often. Granted, his reasons are entirely justified, but even he has his own limits, and what better way to finally push him to take the next step forward than someone who feels just as guilty about his past, despite both not having taken actions intentionally to cause harm? Their rather similar personalities as well will be able to chime a smooth flowing ring to yield good results as well. "There can be miracles when you believe. Though hope is frail, it's hard to kill. Who knows what miracles you can achieve? When you believe, somehow you will, you will when you believe." If there's anything we learned about the series thus far, it's that the possibilities are endless when you believe. And if believing can create such miracles, then who knows what may be able to happen within the world of Kingdom Hearts? In any case, it all adds up to that as much as I'd love to see this film make an appearance in this beloved series, we all know it'll never happen. Even without that, there are still countless possibilities for what can happen both inside and out of our imaginations, and that makes everything worthwhile.